TURTLES EAT FISH AND LOVE KOI PONDS! Turtles are amongst the most beloved creatures found in the world. They are generally harmless, have a calming demeanor about them and usually are a welcome addition to any landscape. Some species of turtle have beautifully colored shells, some can grow to the size of a small car and others can live for hundreds of years. Turtles have endured many of mans mistakes over the years and though a few species have had their populations negatively impacted, most have made adjustments and seem to be resilient. For this reason turtles will probably be around for a long time to come and will most likely outlast man. Turtles generally don’t impact or have conflict with people. There have been some cases of snapping turtles biting but in most every situation, man is at fault for the conflict. However, in recent times, there has been some problem with turtles that are taking up residence in man made lakes. Turtles love water and most any turtle will take advantage of any stream, pond, lake or river that keeps a constant supply of water and is home to fish or other aquatic life. Most turtles love fish and will readily feed upon crayfish, catfish, carp, koi, insects, dead animals and even some live small wildlife. Other species are mostly plant eaters and prefer a vegetarian life style if available. There are over 200 species of turtles found around the world. Though some will venture into brackish or salt water, only sea turtles live in the ocean all the time. Turtles can be found all over the planet and most every continent has at least one species; the only except is Antarctica. All turtles reproduce by laying eggs in the spring. These eggs will hatch late summer to early fall and new offspring will begin life late in the year. If its cold enough, turtles will hibernate and though they can remain active year round in southern climates, most will lay quiet during cold spells. It’s during this time that many predators such as raccoon, alligators and bear will readily prey upon turtles. Turtles are slow moving and offer little resistance so they present an easy target to most carnivores that are smart enough to get past their hard protective shell which serves as their only defense. In fact, many people enjoy the consumption of turtle and regularly hunt them for food. Turtles can become a problem when two vital ingredients are locally available. First, they need water. Any small body of water will attract turtles. Next, they need food. If the water has food in it or around it, turtles may like to “move in” and take advantage of the offering. Food will present itself in the form of fish or plants. Any man made pond with fish such as koi, crappie or carp will surely get the attention of any local turtles. Similarly, rice fields offer excellent harborage and food for turtles as well and if left unmanaged, their feeding will surely impact the harvest. Most any aquatic farming environment that grows vegetation can become a home to turtles; if they don’t like the main crop being grown they will almost assuredly like the environment. In residential areas, most problems occur when local turtles find a man made pond which is home to koi or other ornamental fish. This “natural fish tank” is a prime target for many predators including raccoon, fox, coyote, hawks, otters and turtles. Since turtles can be a somewhat “stealthy” predator, it’s not uncommon for them to move into a small pond and go unnoticed noticed for some time. The unknowing landowner can tell that his fish are being removed but doesn’t know what’s responsible since there is no real visible evidence. They keep replacing the fish and at some point the culprit may be seen leading to some action. The same is true with certain plants. Some turtles will move into a small body of water that doesn’t have fish but the local landscape is growing all it needs to live. The turtle will live on the local plants and retreat to the water when danger is present. These conflicts are sure to continue as man insists on creating these local “micro environments” which wildlife like. When setting up such landscapes, its important to understand that any local animals will take notice of your efforts and if the ingredients are right, they will naturally be attracted to what is created. This is perfectly normal and natural and they don’t know any better so either build the environment with this in mind or be prepared to take some corrective actions if problems should arise. Since turtles are such a great natural resource, rarely does it make sense to destroy them when they move onto your property. For this reason the preferred way to deal with local problems is to trap out the ones which are causing the damage and relocate them at least 10 miles away. There are several traps available that can be utilized and the secret to successful turtle trapping is matching the right trap to the targeted turtle. 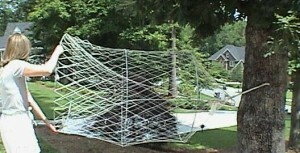 Over the years, three styles of turtle traps have evolved that work well. All are very effective when used right so try to use one which will fit your landscape as well as take advantage of the local turtles behavior. For example, if you have nuisance turtles that are feeding on fish you keep in a pond or lake, the use hoop traps can be very effective. We have them in two sizes; the 1″ x 30″ x 6′ TURTLE HOOP TRAP is good for turtles 2 feet long or less. 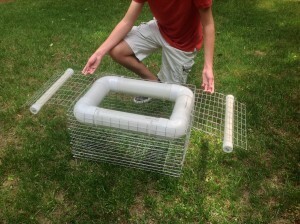 For turtles that might be 2 feet long or bigger, get the 4″ x 36″ x 6′ TURTLE HOOP TRAP. Match the trap with the size of the turtles you are targeting and you should be able to consistently catch any that are out and about foraging. Use some target fish as bait though catfish or carp will work if available. Bait the trap, set it out away from shore and you should be able to catch some quickly. If they are set right, trapped turtles should be able to stay alive and can then be relocated. Be sure to keep the trap filled with bait and check it at least once day. Even one turtle can eat a lot of fish and its not uncommon for the first one in the trap to eat all the fish. If you set enough bait in the trap, it will be possible to catch several turtles at one time which will effectively save time. 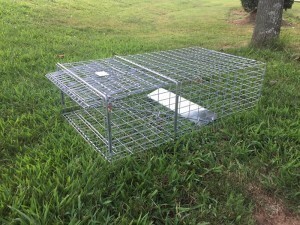 The big advantage of this type trap is that you greatly reduce the possibility of trapping non-targeted animals because the trap is in the water. When using fish as the attractant, this is a big help at keeping animals like raccoon or cats from stealing your bait. If you are unsure what they are eating or if you want to simply reduce local populations, another type trap that may work is the TURTLE SUNNING TRAP. Since most turtles like to lay out on logs, rocks or other flat, above water line objects, the Sunning Trap may be considered. This trap is only for water use and is also known as a Floating Trap. It basically offers a resting place for turtles that like to lay out and absorb the sun. Turtles can easily access the trap via the inclined ramps located on either side. No bait is needed. The concept and only attractive feature of the trap is that it relies on the turtles desire to sun itself. This trap is entered by ramps on either side which will allow targeted turtles to climb above the water line. Once up the ramp they will come to the round PVC pipe where they will attempt to lay still. The roundness of the pipe will invariable cause some turtles to slide over and into the holding cage. And those that are able to remain comfortable will eventually decide to dive back into the water. And from their position, the only side to dive is the side with the holding cage so once they jump off the PVC, they’ll be caught. These traps are highly effective, easy to use and will last for many years. For shoreline trapping, get a land trap. These come in two designs. 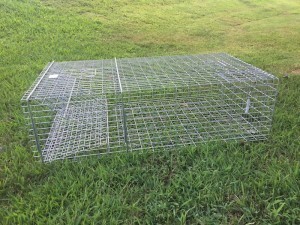 The SINGLE CATCH TURTLE TRAP one uses a locking entry door which is similar to any standard animal live traps. It measures 32″ long by 18″ wide by 9″ tall. Bait is placed behind the trip pan, turtles enter and as they move over the trip pan, they release the door which locks them inside. These are true “single catch” traps and will work well on any size turtle up to 40 lbs. If you have a lot of turtles to catch, get the MULTIPLE CATCH TURTLE TRAP. Its bigger and uses a swinging entry door to allow several turtles to enter and get caught. For big problems, this design will prove time and energy saving. It measures 42″ long by 24″ wide by 12″ tall. Turtles can become a nuisance around the home when lakes and rivers offer prime nest sights. If you have too many around and want to relocate some, use a live trap for fast and effective catches. Once caught, relocate them at least 10 miles away to insure they won’t return. Be sure to release them somewhere that will provide a natural food supply and environment for them to live comfortably.